We loved our stay here. This unit was super clean and really nice. We are looking forward to booking again next year! It definitely exceeded our expectations!! This condo is absolutely beautiful! The decor is gorgeous and the space is amazing. We all loved the layout and our favorite was that all 3 bedrooms each had a bathroom. It was super clean and the beds were so comfy. We will definitely book this condo again. It was so impressive! The location and condo were perfect. We had enough space for everyone without being on top of each other. The building amenities were great. The condo was clean and homey. The beds were so comfortable. Everything was just as described and the 24hr call/text service was prompt and helpful. It was a great relaxing weekend with the whole family. So relaxing and beautiful. We drove in the same day Tropical Storm Gordon made landfall. The owners and management company were both in touch with us as we made our drive in with weather condition updates. This went above and beyond in my eyes. The condo was great for two but would be great for a family as well. The amenities were nice to have. And the balcony.... It's fantastic!! We loved how large it is. We will miss sitting out there every evening watching the world go by. We will recommend this condo to all of our family and friends coming to the area. I could go on and on but I will stop with this. It's clean, comfortable, and relaxing and close to many things. Thanks for offering such a great place. We will definitely be back. This condo is decorated with stylish, modern furnishings and is conveniently located near the intersection of Beach Blvd. and Gulf Shores Parkway. Two of the bedrooms are quite large, but the third is small and lacks a closet. The living room can seat four adults comfortably, but wouldn't want to squeeze in any more than that. The kitchen is spacious, but lacked a few necessities like hot pads (we bought some and left them), salt and pepper and coffee filters. We were there through Tropical Storm Gordon and the management was very proactive about giving advice and keeping us updated. My family enjoyed Labor Day week at this beautiful condo. it was very clean and very well stocked with everything we needed. Chairs and wagon were added bonus. We will definitely stay there again. Only one compliant was the ice maker in fridge wasn't working. Could have been turned off. Minutes from the beach! Like 3 whole minutes from front door to beach in between your toes. I saw a lot of reviews on here complaining about the elevators so we were prepared for long waits but I honestly dont know what the other reviews were talking about. I think the longest we waited for an elevator was maybe 4 minutes and that only happened once and they were working on one of them at a time during our stay so we were down to one elevator. The condo is beautifully decorated and so comfortable. We had the bed in the master and the mattress was fantastic! This condo is on the tenth floor and the view is perfect. Its private and you can see for miles. We even saw dolphins in the distance on a few separate occasions. TVs in every room which was nice for us to get some alone time when our kids were resting or for my toddler to watch in her room while others were still asleep. The management company was very quick to reply and since we stayed during a huge Tropical storm, they sent us great informative updates about the weather and what was happening. Vacations with kids can be hit or miss but this one was perfect. We got lots of time to relax and being so close to the water made it really easy to go back for naps or a forgotten item. Theres lots of beach toys there as well as beach chairs and two umbrellas. When we go back, well be staying here again! We loved our stay! We had 3 couples all with small children. The splash pads, indoor/outdoor pool, and hot tubs were an amazing added bonus. The condo is also super close to most of our favorite hangout spots. Only downfall was the slow elevators, and they are slow, but we didnt mind going down stairs when needed. We just happen to stay during hurricane Gordon and the owners were great about keeping us informed of the storm and letting us know what to do (thank goodness it wasnt as bad as the news made it) & we all stayed safe and really only missed one day of the beach. We would all definitely recommend staying here!! Our families have been to Orange Beach/ Gulf Shores many times. This was probably the last time with 3 generations all together, 82 yr old to 5 month old. Condo was perfect for all 8 of us to spread out. Hurricane Gordon blew through in the middle of our stay but the in door pool was great. Have many wonderful memories for the rest of our lives, this was a special place for our family. The property was lovely. Well decorated and most importantly comfortable and functional. Our stay included two families of 4! The double kings was perfect to accommodate and the extra room was wonderful for the toddlers to sleep. Kitchen was great and came well stocked. Things to know: You will need Tupperware...The Dryer does take a while to dry clothes/towels (expected).. The Phoenix was wonderful. Right on the beach! The indoor pool and hot tubs was perfect for a day to stay in and also to take a break from the sun. The outdoor pool was also big enough and very enjoyable. Another bonus included the small kid pool that was perfect for our toddler. We grilled two nights and the grills provided were wonderful. We enjoyed our stay! We will be back! This was our first experience with a VRBO property, and we could not have been more pleased. The location of Silver Beach is super convenient--right across the street from grocery stores and restaurants in the heart of Orange Beach. The keyless entry was awesome! The beach was beautiful (even with Tropical Storm Gordon steaming through mid-week), and Unit 103 was in a perfect spot close to the dog walking areas and parking. We could not possibly have wished for a better beach get-a-way location. The unit was nicely decorated and furnished with all the comforts of home. We cooked several meals in the well-stocked kitchen. The views from the balcony were amazing. And I can't begin to say enough about the Alabama Getaway management team. They went out of their way to help us through the tropical storm and made sure we were safe. We were so grateful! 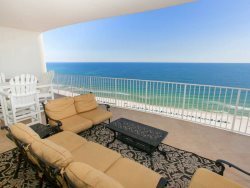 I'm ready to book our next beach trip and will make our plans around when we can book this unit. This was also the very first time we have been able to bring our pup with us on a beach trip, and that was a great gift for us. Charlie gave it two paws up! The dog walk areas were nice and stocked with waste bags and trash cans. We met several other sweet pups and their families, so that made it even more fun. We can't wait to come back to the beach--THANK YOU!!! Everything was great! The whole family loved it! Even though it rained the whole trip we were still able to have a great time! Everything was very convenient! Beds were very comfortable. The showers were very spacious! The condo overall met our standards and we were very pleased! Our family of 4 adults and 1 child was very comfortable in this 3 bedroom 2 bath condo. It was furnished exactly as shown in the pictures. A big plus was the beach wagon packed with chairs and an umbrella. Very beautiful condo with perfect views. Close to restaurants. We enjoyed our stay here very much and plan on returning. The condo met everything we were looking for - comfort, space, view, and elegance. The condo was perfect for a party of 8. Everyone was comfortable, the kitchen was wonderfully stocked with dishes, glassware, appliances, baking needs, utensils - everything was there that we needed! The view was spectacular and the location was perfect to restaurants, shopping, Gulf Shores Park, etc. I would stay in this condo again and again and again! Cheers!! They condo was wonderful. Very neat and clean. Spacious and we were very pleased that it had beach hairs, toys, and a cart already available for use. Couldnt have asked for a better place to stay for our weekend getaway. There were 11 of us, and we definitely had plenty of room for privacy and areas for gathering together. It was the perfect house for us. Lots of room for parking. Short walk to the beach. Nice view. Extremely comfortable. Great pool area. Has a lot of stairs, but has bedrooms on the bottom floor for easy access withought carrying luggage up stairs. A few minor fixes needed, but overall, we had a great vacation here. Would love to come back.